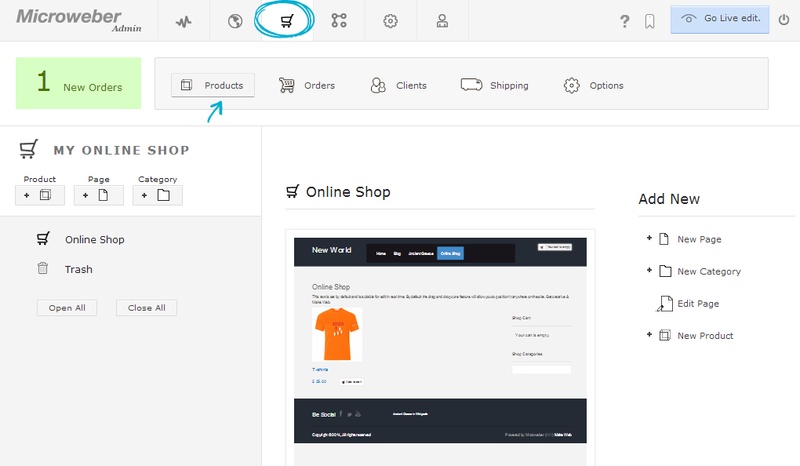 The Online Shop section can be located on the Admin Navigation bar and is distinctive with its cart symbol. The section is divided in five sub-sections: Products, Orders, Clients, Shipping and Options. You can also create a New Page, New Category or a Add New Product or just Edit the existing page. 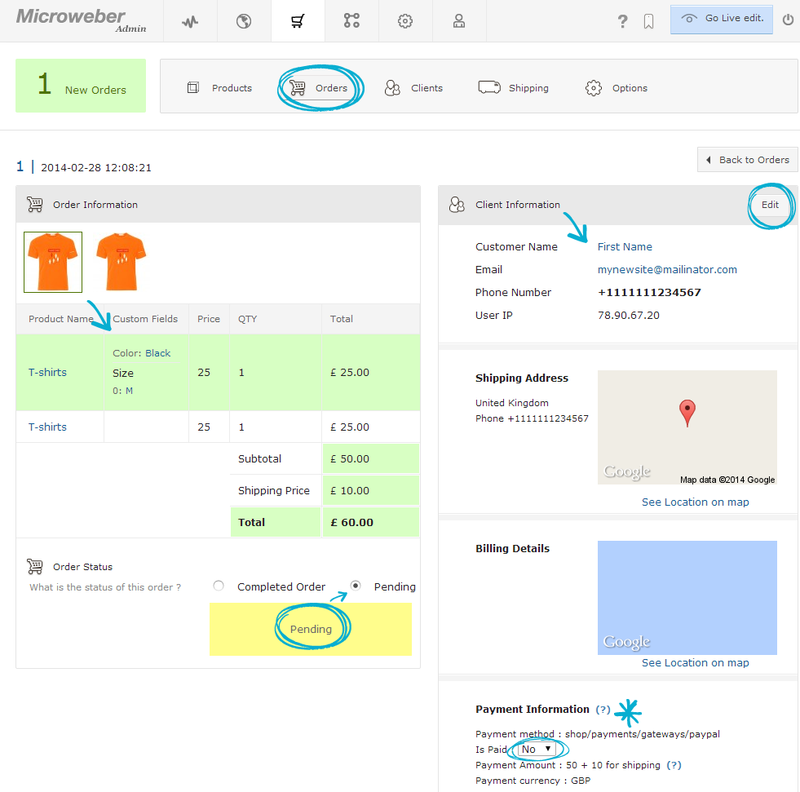 Clicking on the Orders tab lets you see your orders' ID, their status (Pending or Completed), the amount of money due to be paid, whether it's paid or not and the client's details. A green box on your left lets you know if there are any new orders left unpaid and still pending. If you have a greater list of orders there is an option to search for a specific one. You can also sort your orders by Date, Alphabetically by Name or by Amount. 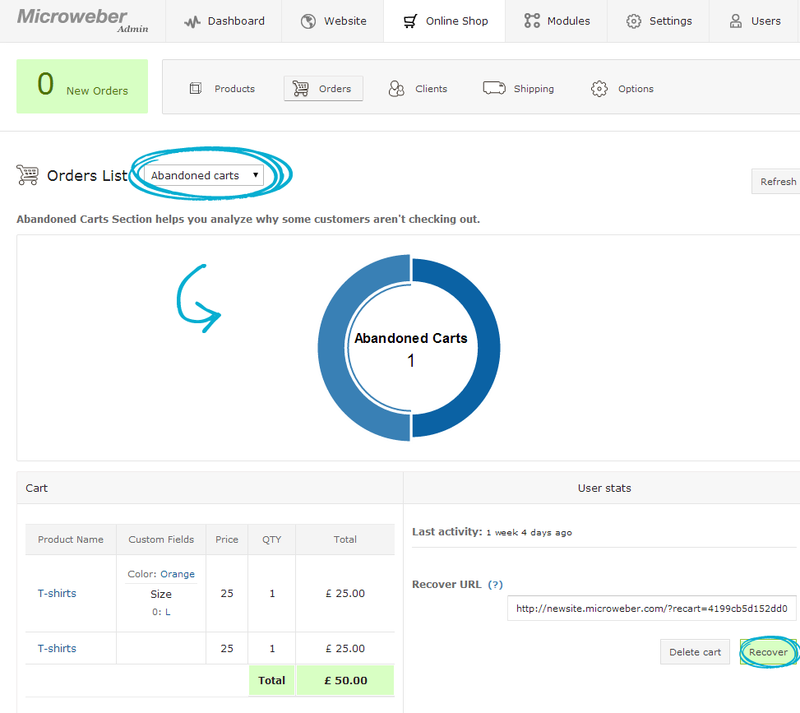 A check for Abandoned carts can also be performed from the drop-down menu just beside the Orders List. The blue circle will visualize your Completed Carts to Abandoned Carts ratio. If you wish to see detailed information about a specific order, clicking the View Order button opens a new screen with all details regarding that order. You can change an order's status from here, labeling it as completed or keeping it in a pending state. The Clients tab is pretty straight-forward. It contains detailed information about the people who have ordered from you, including their Name, E-mail, Phone, City and Country Details and number of orders from your online shop. You can also specify your type of shipping – is it Fixed for each and every product, do Dimensions or Weight matter when defining the shipping costs, or do you charge a certain amount Per item? 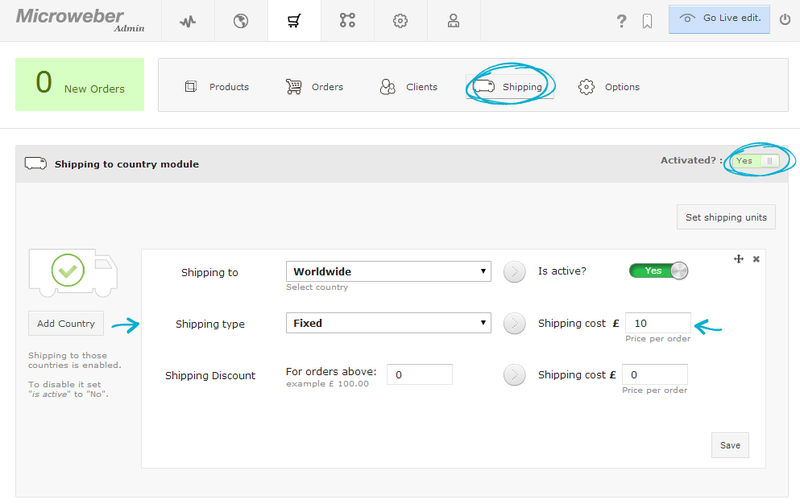 In case you want to define different shipping costs and settings to specific countries, clicking the Add Country button on your left will open a drop-down menu. Here you can choose a specific country, change the shipping type, cost, discounts or other, or even disable shipping to its territory using the slider. 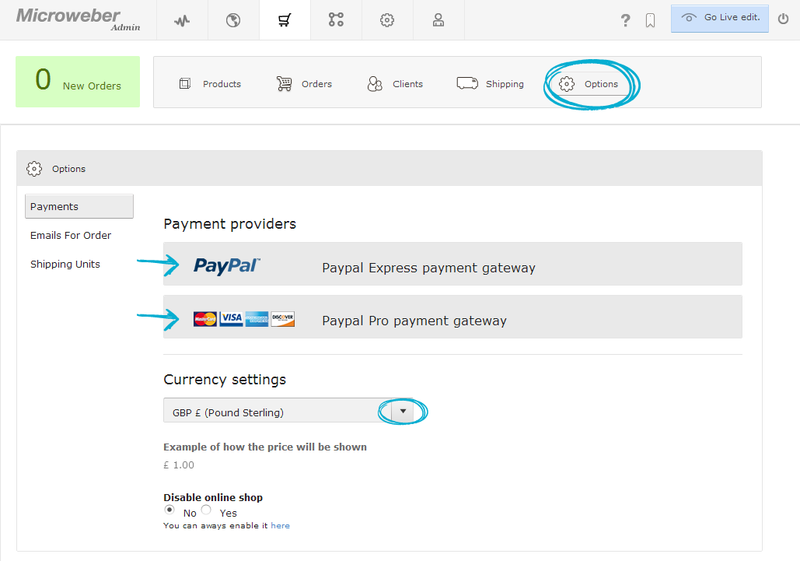 The last tab, Options, lets you define the Payment Providers and the currency you’ll be using in your site. You can drag and drop a certain Payment provider to change its place in the list. 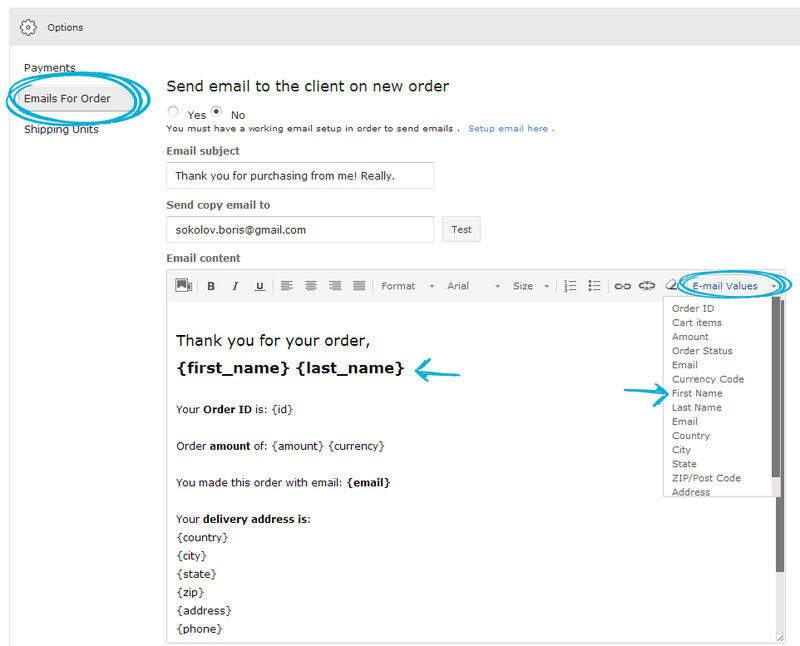 Clicking the Emails for Order tab leads you to the default e-mail template that is sent to any clients that make orders from your online shop. You can define whether or not you want to send an e-mail to your clients in case they order from you and customize its content to your liking. Last but not least, the Shipping Units button lets you define the usable units for weight (kilograms or pounds) and size (centimeters or inches) applicable to your online shop.